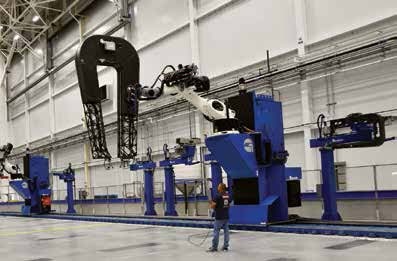 WICHITA, Kan.—Spirit AeroSystems engineers have combined a wide range of robotics hardware and software technologies to meet the complex needs of inspecting the company’s composite aerospace components, such as fuselages, wings, and substructures, the company reported. Spirit is implementing the new robotic NDI technology at its headquarters location in Wichita, Kansas, and plans to use similar technology at its Prestwick, Scotland, facility. Spirit engineers are also investigating and applying robotics technology for other manufacturing applications where flexible automation—such as machining, sealing, and material handling—is required. Spirit AeroSystems (www.spiritaero.com), focusing on composite and aluminum manufacturing, designs and builds aerostructures for commercial and defense customers. The company’s core products include fuselages, pylons, nacelles, and wing components for the world’s premier aircraft. Headquartered in Wichita, Kansas, Spirit operates sites in the U.S., U.K., France, and Malaysia.